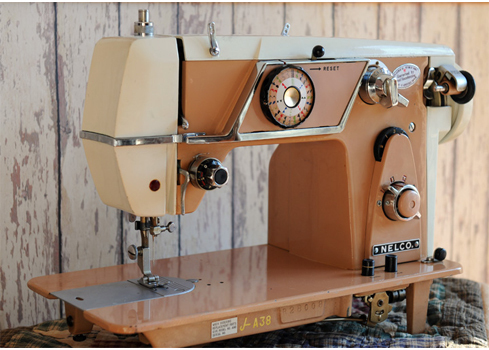 This is our really good looking Nelco Sewing Machine. We don't know anything about its pedigree nor did we get a manual with it. 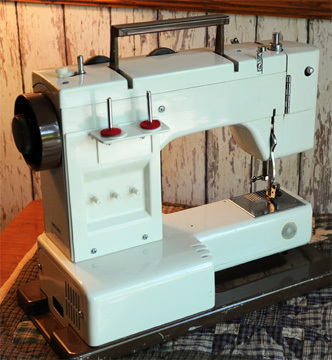 This Nelco was given to Jim during Father's Day 2008 by Elizabeth's Mom, Eileen. The machine came from New York. We were fortunate to receive the bed extension with this machine. While it isn't rock-solid in the configuration shown, there are feet under the extension which can be lowered for added strength. 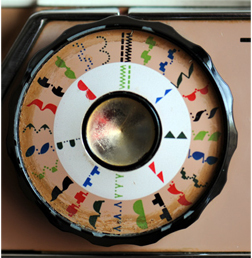 A variety of stitch patterns can be selected using the large round knob on top. Stitch design can be seen in each of the colored tiles on the machine's front. The large knob mounted on the right-hand post is used to select stitch length. The button in the center of the latter knob is depressed for reverse sewing. Feed dogs are dropped by turning the small knob near the base of the machine. Mounted on top are two vertical knobs. The right-hand knob adjusts stitch width when using zig-zag and other patterns. We still haven't determined a purpose for the top-left knob which contains arrows pointing left and right. 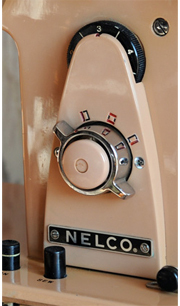 The Nelco is constructed mostly of aluminum as was most machines manufactured during this time-period. However, like many machines of this era it contains what appear to be nylon gears for quiet operation and perhaps as as a cost-cutting measure. Our gears are in good condition unlike similar gears on other machines which tend to be biodegradable. 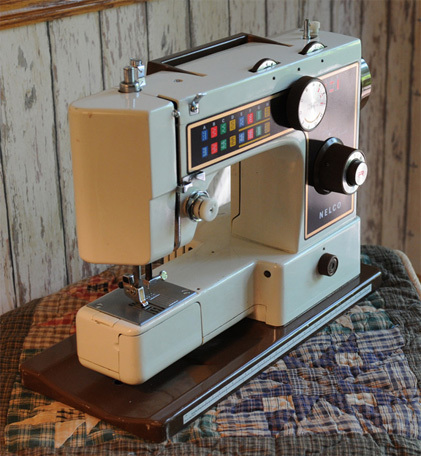 Three pins on the back side of the Nelco are probably for storing bobbins of various thread colors. We don't have a manual for the machine but have lubricated all the moving parts we can find. The machine runs fine. Serial No. 4140 was made in Taiwan. 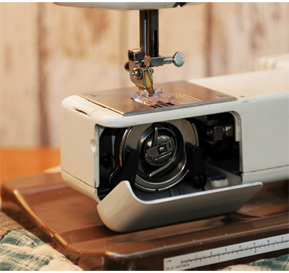 Installing a bobbin doesn't get much easier than this. 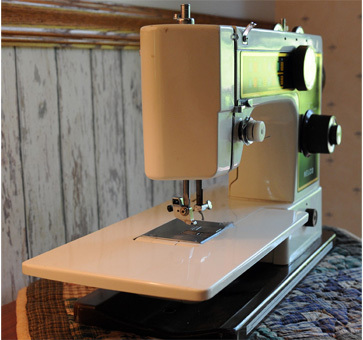 When the bed extension is removed, a freearm door can be flipped open revealing a vertical bobbin. No surprises here. It is much easier to access bobbins like this than those accessible through slide plates. 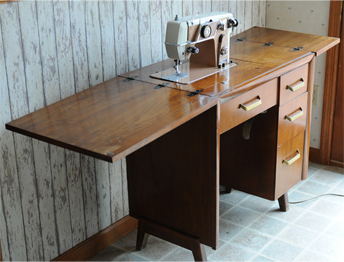 We rescued the good-looking Nelco above from the Goodwill store here in Point Pleasant. It was in rough shape when we brought it home but its looks improved greatly after applying a lot of elbow grease and car polish. Jim likes it because it is brown--except for the pink plate housing the pattern selector knob. We don't have a manual for this machine so there has been a steep learning curve and we still don't fully understand all of its controls. Threading the upper part is pretty obvious as is winding the bobbin and bobbin case installation. Serial number is R28008 and it was made in Japan and that is about all we know about its lineage. Stitch length is adjusted using the black wheel on the right column but it is not indicated in stitches per inch so one must do a lot of testing to obtain a desired stitch length. 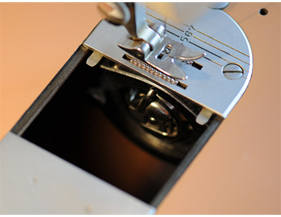 The chrome knob below the stitch length control is used to form button holes. 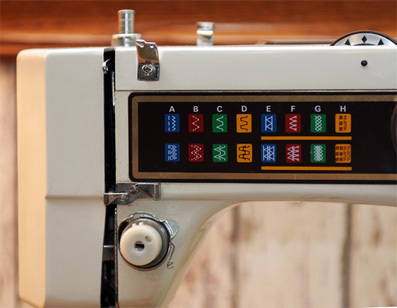 The center of this control is depressed for reverse sewing. The two black push-button on the base (shown in the lower left) are for dropping feed dogs. The top cover and a cam access plate have been removed in the image above. We don't have a manual for the machine so have no idea what to do with the exposed control. The innards of this machine are as complicated as any machine we have and we hope we never have to adjust a single thing. We actually believed this machine was gear driven when we bought it, but were in for a big surprise when we removed the top cover and found a fairly typical motor driving a fairly typical belt drive hidden beneath the skin. Bobbin access is beneath a small slide plate. The bobbin is encased in a bobbin case mounted vertically. The presser foot is 1/2 inch wide with generous amount of feed dogs in a balanced arrangement providing excellent straight fabric feed. The image to the right shows a pattern selector. A sample is shown below which we created on this machine using built-in cams. We moved the selector clockwise from the position shown to sew each pattern from left to right. There are some tricks to moving this selector and using a Reset control somehow associated with it.